Anthony Bourdain cares about what people eat. That sentiment isn't just the broad feeling that he's a chef and wants people to eat well. He cares about food waste, and he seems to care a lot about any food he thinks is dumb, like Kobe beef sliders and fancy ketchup. 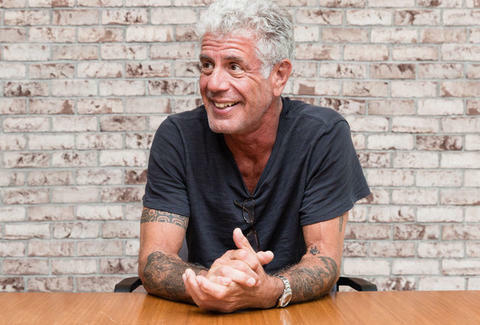 In a new interview with Eater, Bourdain -- who has never been particularly kind to vegetarians and vegans -- weighed in on the Impossible Burger. It's a plant-based burger that "bleeds" like real meat and has a texture much closer to the real thing than the average frozen veggie burger in the freezer aisle. He began by providing a little context about the conditions under which he would be in favor of the burger. "Look, there are a lot of hungry people in the world. I guess if [it] is a means of providing must-needed protein to people who need protein to live, I guess I’m all for it," he said. "As somebody who spent 30 years as a chef, of course I’m going to be resistant to the notion that there’s any replacement for the texture and musculature and funk of real meat," he continued. "So, I’m resistant to it. I hate the idea that people are selling this at a premium at hip restaurants. You know, it doesn’t fill me with joy." He also notes that he hasn't tried the burger yet, which is probably he hates the idea of it rather than the actual burger. Until recently, the Impossible Burger was largely available at trendy restaurants and fast-casual places such as Bareburger, Fat Burger, and Umami Burger. However, that recently changed with the announcement White Castle would begin carrying the Impossible Burger at 140 locations for the price of $1.99 a slider. Part of the excitement around the burger is it not only providing a meat-like substitute for vegetarians. It's about the potential to create a desirable and environmentally-friendly substitute for anyone craving a burger. Impossible Foods claims the burger is far more sustainable than it's cow-based brethren, noting it uses "95% less land, 74% less water, and creates 87% less greenhouse gas emissions."